Environmental Health Officers work cooperatively with food businesses, enforcing the correct handling, preparation and storage of food to prevent food related illness within the community. If you wish to start a food business or have any concerns relating to a food business, please contact the Shire’s Environmental Health Services on 9949 3000. All food businesses under the Food Act 2008 must notify the Shire of their activities prior to operating. Before you start your new venture, it is important to check to see if you need Planning approval first, please contact Planning Services on 9949 3000 for confirmation. Prior to starting your food business please make an initial contact with the Environmental Health Services who can discuss your plans and the application process with you. An application for Food Registration will need to be submitted with floor plans and proposed menu. Once received an Environmental Health Officer will risk assess your application which will then determine the inspection frequency of the business. Once your food business set up is completed, a final inspection will be conducted, if all aspects are satisfactory you will receive a certificate of food business and your new food venture will be approved to start. A not for profit group who cook food for immediate consumption are considered exempt under the Food Act 2008, you will still need to submit the above form but there will be no fee associated with your stall. 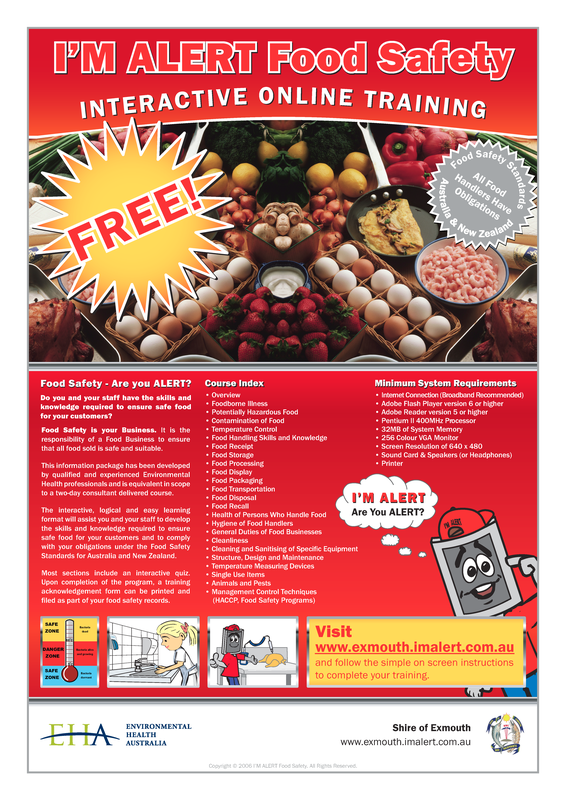 I’m alert is an interactive food safety program which has been designed for food handlers to increase knowledge of safe food preparation techniques as well as knowledge of food poisoning and the spread of bacteria. This is provided free of charge by the Shire of Exmouth to any person who wishes to take part and encourages all food handlers to participate in the training. The program is licensed through Environmental Health Australia (EHA). Please click on the below links for further information and to complete the online training. Start the Online Training Now! Food safe is another comprehensive training tool also available from EHA. As well as the original DVD course FoodSafe now offers and online alternative - FoodSafe online. The same lessons are taught but with an easy to use interface that will save you time and money. For more information about FoodSafe, FoodSafe Plus and FoodSafe Online visit the FoodSafe Website.